still wearin' o' the green. 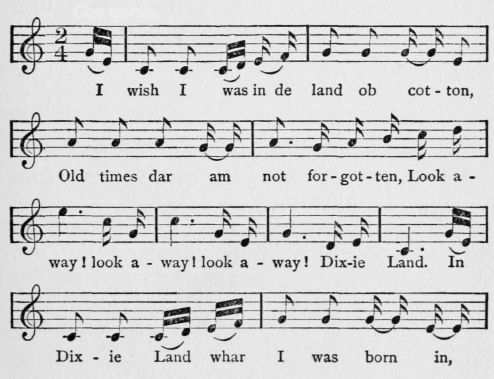 This song had a northern origin and was written in 1859 by a member of Bryant's minstrel show. "Mason and Dixon's line" was the verbal in�spiration of the song. The composer and author had travelled much with circuses, and when the circuses were showing in the north and cold weather approached, the performers longed for the southern tour to begin; and fre�quently the circus people would say, "I wish I was in Dixie!" This catch phrase was used in after years by the author of the song. " Dixie " was written for the grand "walk-around" for Bryant's minstrels. Words by Daniel Emmet. Con spirito.